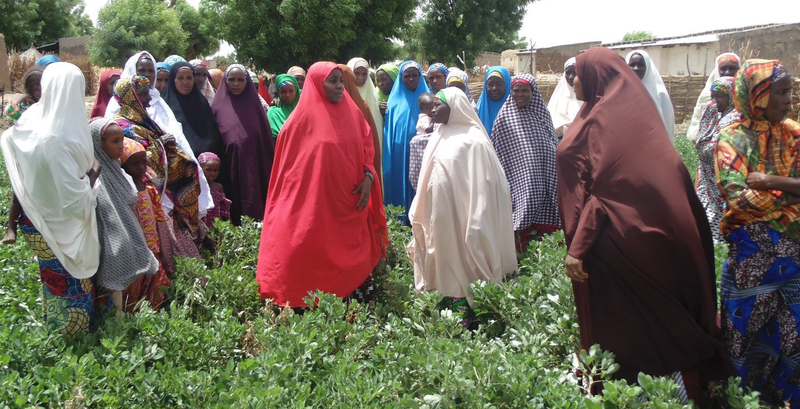 Since the 2015 cropping season, farmer field days have been regularly organized in northern Nigeria. Field days bring farmers and curious community members together to showcase and discuss details of introducing improved groundnut varieties particularly – SAMNUT 24, SAMNUT 25 and SAMNUT 26. 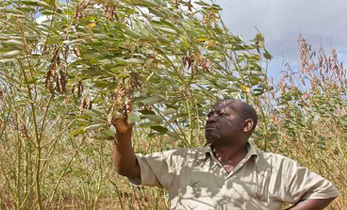 These field days empower farmers and community members through information on where to acquire improved groundnut seeds. 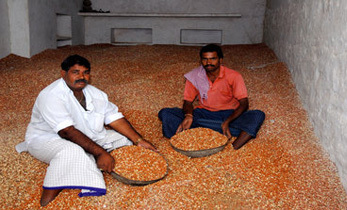 This not only increases market opportunities but also enhances farmer-to-farmer exchanges of improved seeds. 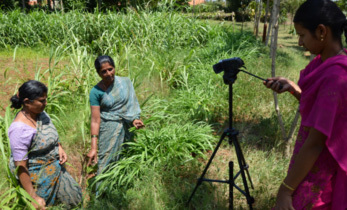 Apart from increasing participation of women, field days have become platforms to showcase hard work and achievements by farmers who host either the demonstration or seed production plots. Green (or vegetative) field days are organized between August-September for the main season and between March-April for the off season. Nearly 6,000 people (4,712 men and 1,277 women) have participated in the field days over a span of three years. Women’s participation in these events have been on the increase, moving from 7% in the first year (2015) and 21% during 2016 to 31% in 2017. Similarly, the participation of and support from community leaders in field days has been sustained. 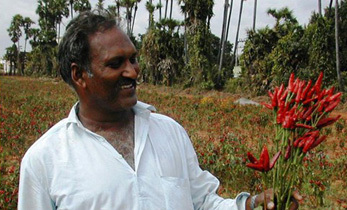 For example, during the 2015 main cropping season, demonstration and/or seed multiplication plots of five community leaders (at least one from each of the five states covered by the project) were used as field day sites. Convinced by the pod and fodder yields of SAMNUT 24, community leaders distributed at least 3 kg of unshelled seeds to interested members of their communities in the 2016 cropping season. After harvest and drying, farm-families returned all the seeds they received and retained a larger proportion to cultivate in 2017. 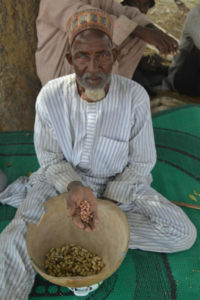 “I have no grudges against those who collected seeds from me last year since they have returned what I gave and have even given out some to other farmers,” says Ardo Habu of Ganbawa community. As all these community leaders also rear livestock they found the fodder yield and its quality appealing. 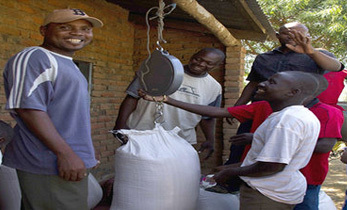 The approach used by community leaders to distribute and recover seeds from community members aligns well with the ‘in-kind pay-back’ method. 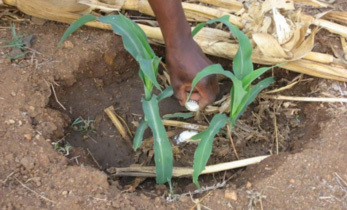 Suitable project partners are given basic seeds and associated inputs at the onset of each cropping season and are expected to pay back the same quantities of lower classes of seeds plus the cost of associated inputs at the end of each harvest. In the cases being reported here, the beneficiaries of improved seeds commit themselves to uphold this principle and pass on seeds from their harvests to other farmers. As a result, community leaders across the project sites in northern Nigeria are becoming vital components in the dissemination process. Project: Increasing groundnut productivity of smallholder farmers in Ghana, Mali and Nigeria (2015-2018) project. Partners: Institute for Agricultural Research (IAR) of the Amadou Bello University (ABU), Centre for Dryland Agriculture/Bayero University, Kano (CDA/BUK), National Agricultural Seeds Council (NASC), Federal University of Agriculture, Markudi (FUAM), Green Sahel Agricultural and Rural Development Initiative (GSARDI), Catholic Relief Services (CRS), Women Farmers Advancement Network (WOFAN), Kano Agricultural and Rural Development Authority (KNARDA), Jigawa Agricultural and Rural Development Authority (JJARDA), Kebbi Agricultural and Rural Development Authority (KARDA), Sokoto Agricultural Development Project (SADP), Katsina Agricultural and Rural Development Authority (KTARD) and ICRISAT.